For years now analysts, and the media have been trying to convince everyone there is no inflation despite central banks massive quantitative easing programs. Of course this is ridiculous. They just choose to ignore where the inflation has manifested. In 2008 inflation spiked in the commodity markets contributing to the severity of the last recession. One could even make a strong case inflation was the main cause of the recession. From 2011 until recently inflation has focused mostly in asset markets, especially the stock market. But it’s also appeared in healthcare, housing prices, insurance premiums, education, etc. So to claim there has been no inflation one has to willfully turn a blind eye to where the inflation is. We’ve actually had massive inflation, it’s just that it has run mostly in sectors that people don’t mind seeing inflation, namely the stock market. I think that is about to change. As I’ve noted many times in the past, virtually every time the price of oil has spiked 100% or more in a year or less it has led to a global recession. The pressure that puts on the middle class is too extreme and discretionary spending grinds to a halt. In previous articles and videos I have noted that the CRB is now forming a right translated multiyear cycle. Right translated multi-year cycles are indicative of bull markets. 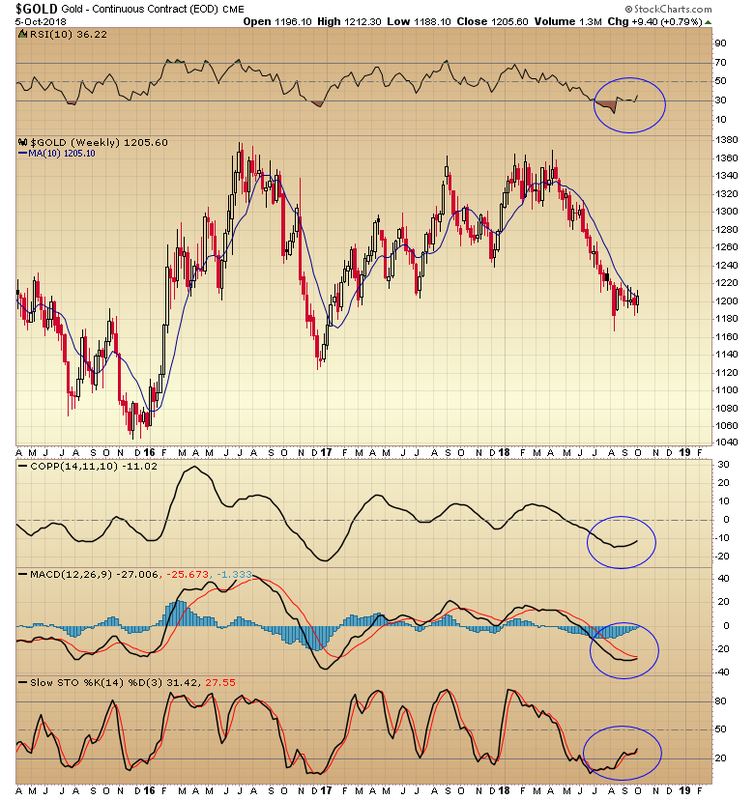 As you can see in the next chart all of the weekly indicators are turning up for the commodity complex. This is in stark contrast to the stock market, which I will show later in the report, that is starting to turn down. Don’t get me wrong, I don’t think the stock market has topped yet, but we are in the final innings of this cyclical bull market. In fact the weekly charts are starting to look constructive in more than just the CRB. 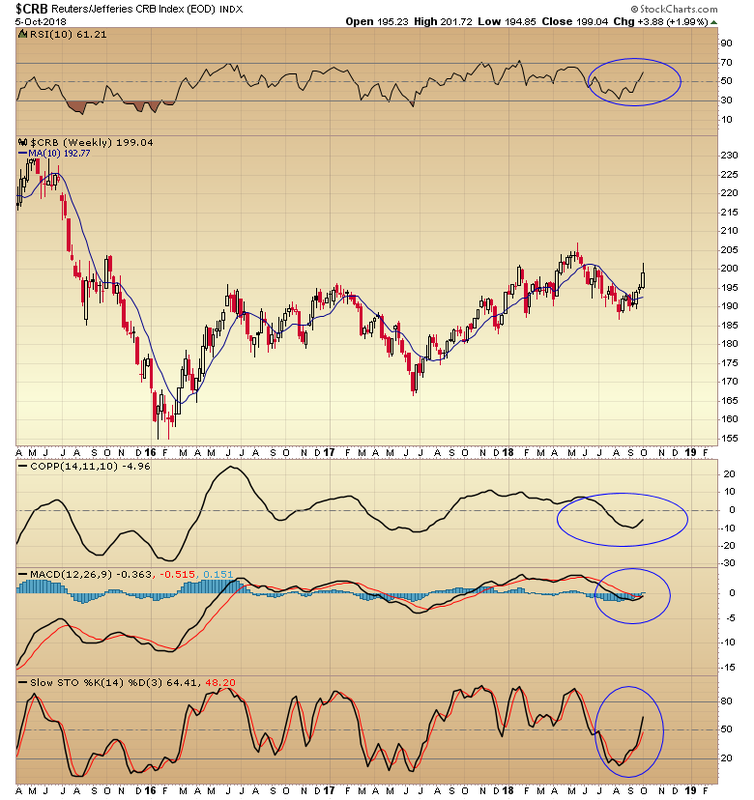 The momentum indicators are starting to turn up in the metals sector as well. 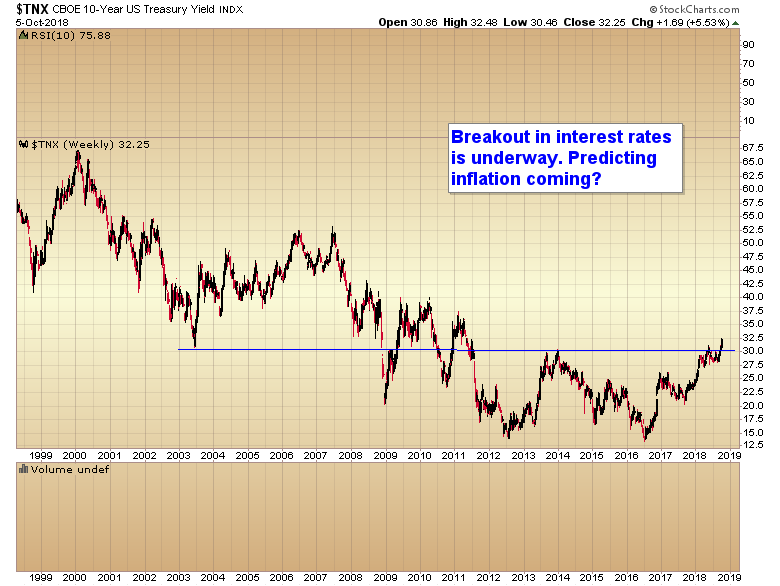 I might even go so far as to suggest that the bond vigilantes have finally woken up, and the breakout above 3% is a signal that inflation is finally going to start leaking into the commodity complex. As I said, I don’t think the stock market has topped yet, but there are already sectors that have rolled over and started a bear market. 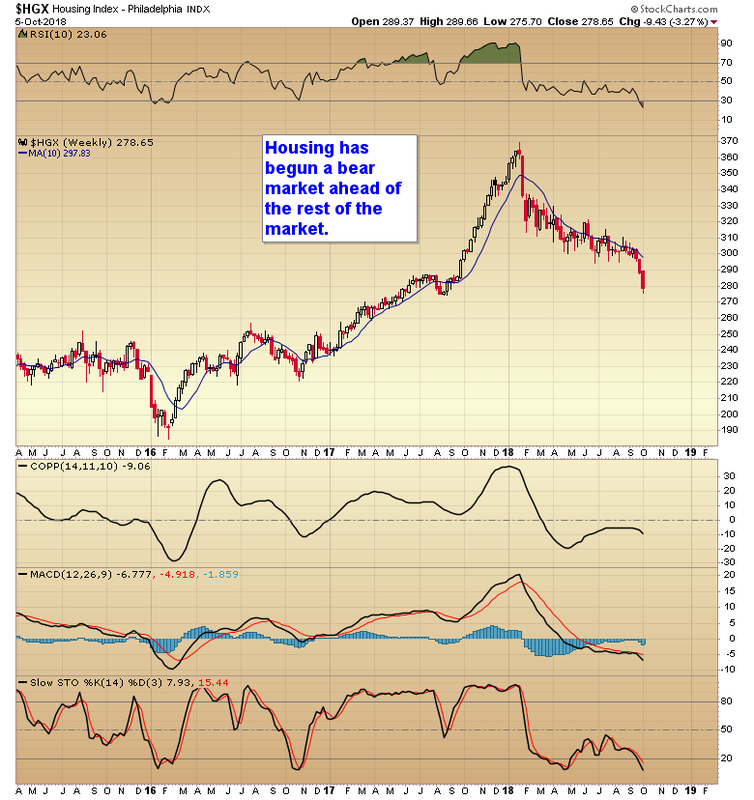 Housing topped early in the year and is now in the grip of a bear market. 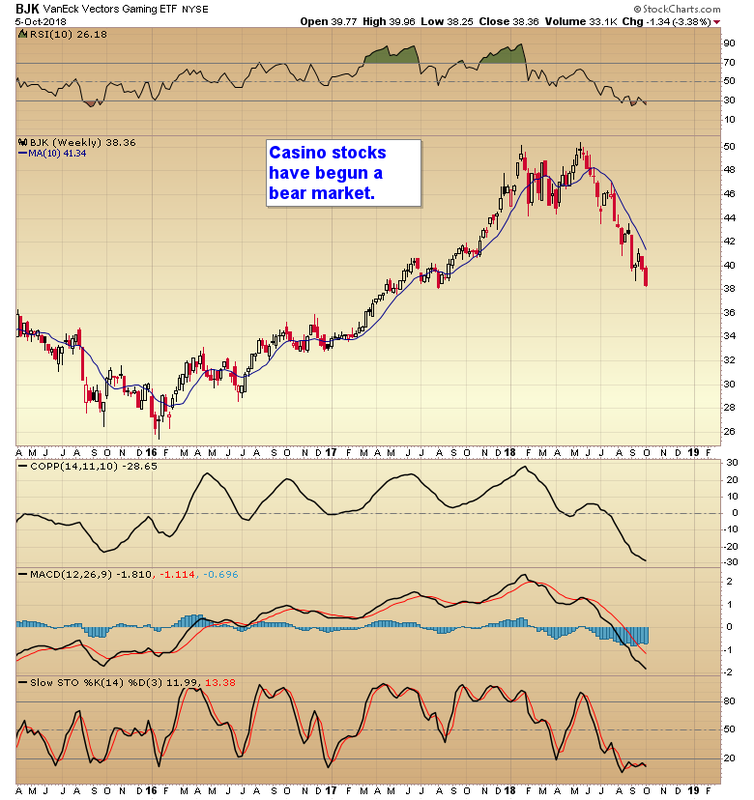 The casinos, which I consider the canary in the coal mine, also appear to be starting a bear market. And as I noted in a previous video the banks are starting to diverge and the advanced decline line is starting to falter. I do think we have at least one more leg up into mid-2019, and investors will want to buy the next dip in the stock market, but do so with the understanding that we are in the final innings, and at some point next year it’s going to be time to get on the sidelines and sidestep the next recession. (Keep in mind I’m only expecting a cyclical bear market). The long term secular bull market isn’t in jeopardy. We had a recession in 91 during the last secular bull and it didn’t stop the long term trend and a recession won’t stop it this time either. 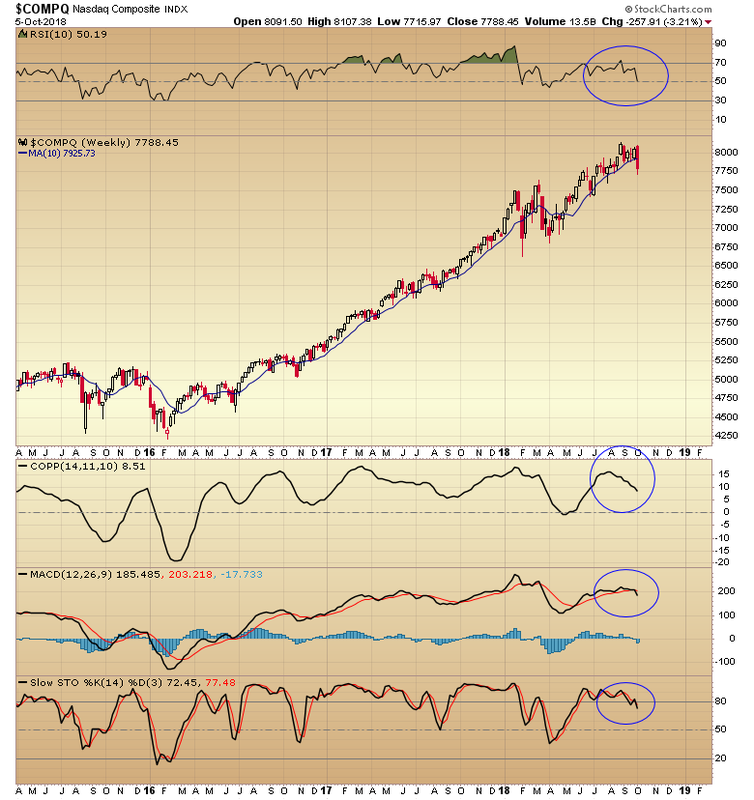 As you can see in the next chart of the Nasdaq, I was correct to warn that it was too late in this intermediate cycle to be chasing price. There was little chance of a sustained breakout above 8000 this late in the rally. 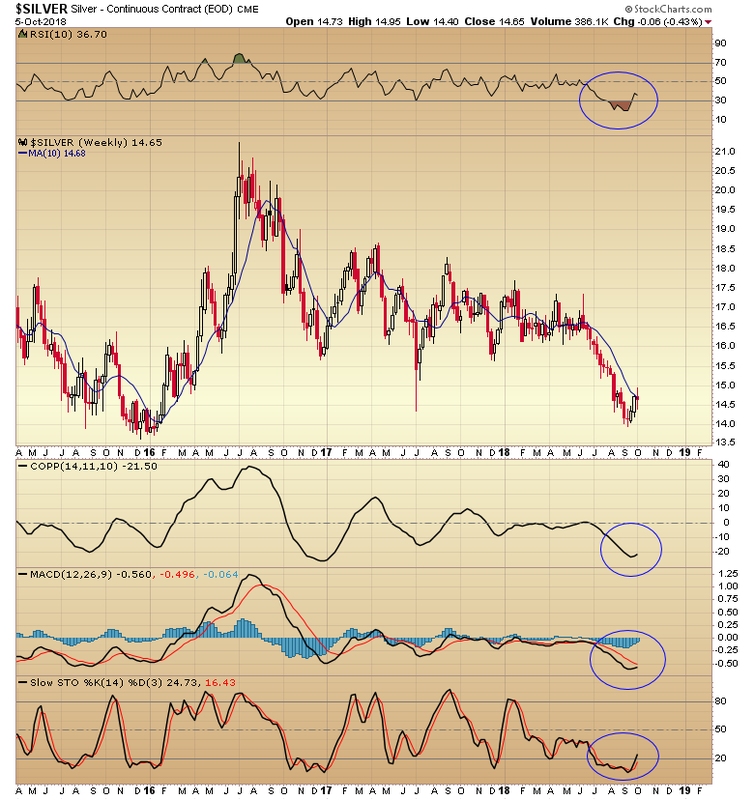 All of the momentum indicators are turning down in the stock indexes, while they are turning up in the commodity complex. So I think one should focus on the commodity markets for the time being until the stock indexes complete their correction, generate some bearish sentiment levels, and set up for the final run to the cyclical bull market top in 2019.